The 2020 Kia Telluride EX trades the S trim’s flashy style for worthwhile features. There’s substance to the 2020 Kia Telluride’s style. The 2020 Kia Telluride is a crossover SUV that uses its blocky styling to stand out in a sea of homogenous three-row family haulers. With the 2020 Telluride, Kia finally offers a vehicle with room for growing families. The Telluride sits above the Sorento and is the largest Kia ever sold in the U.S., and it’s available in LX, S, EX, and SX trim levels. 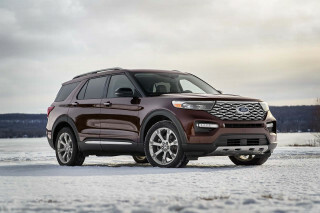 The Telluride shares its underpinnings and 291-horsepower 3.8-liter V-6 teamed to an 8-speed automatic transmission with the Hyundai Palisade. The two differ primarily in styling and feature availability. The Telluride’s 197-inch length means it’ll fill more garage space that competitors such as the Honda Pilot and Toyota Highlander, but it’s not as big as a Toyota Sequoia or Chevy Tahoe. 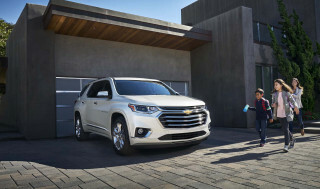 An upright grille flanked by tall headlights that flaunt LED halo running lights in most trim levels gives it a mini-Suburban look that’s emphasized by a more squared-off look from the side than its rounded competitors. Base models wear 18-inch wheels while higher-trim versions ride on 20-inch wheels that fill the large wheel wells. The Telluride’s V-6 provides good but not ample power and works well with the 8-speed automatic transmission. The Telluride’s best attribute might be its supple suspension, even with the optional 20-inch wheels. Fuel economy is average at 21 mpg with the optional all-wheel-drive system. Inside, the Telluride has a clean look with either an 8.0- or 10.3-inch touchscreen for infotainment that protrudes from the low dashboard. The Telluride’s infotainment system includes Apple CarPlay and Android Auto compatibility and all three rows have at least one USB port. The Telluride’s interior feels airy, with good room for up to eight passengers. A three-seat second-row bench is standard, but most trims are available with captain’s chairs that slide forward for easy access to the relatively spacious third row. There’s more room behind the third row in the Telluride than in most of its competitors, but much of that space is above the window line. Still, with the third row folded, the Kia offers 46 cubic feet of cargo. Every Telluride comes standard with active safety tech such as automatic emergency braking with pedestrian detection, blind-spot monitors, active lane control, and adaptive cruise control. 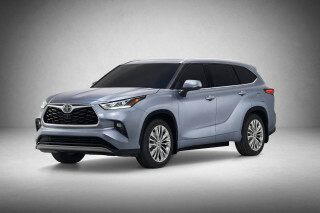 High-trim versions offer a few more goodies such as a blind-spot camera that displays in the instrument cluster and automatic high-beam headlights. 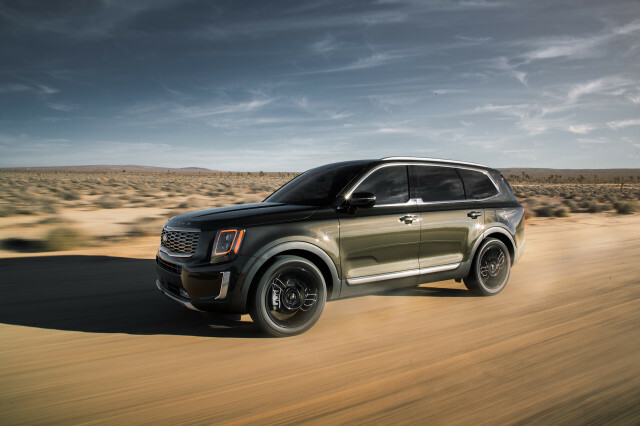 The 2020 Kia Telluride costs around $32,700 to start, The well-equipped Telluride EX strikes us as a good value at around $40,200 with all-wheel drive, leather upholstery, upgraded infotainment, and a sunroof. The 2020 Kia Telluride has a boxy, modern look. The 2020 Kia Telluride is late to the big three-row crossover SUV game. Its styling might be its biggest selling point for many shoppers. The 2020 Telluride casts a chunky shadow, looking more like a 3/5ths Suburban than its slippery soap bar rivals. The wide grille and narrow, upright headlights give it an even wider look than its admittedly hefty 78-inch width would suggest. From the side, the new Telluride is upright and less voluptuous than most competitors—even Kia’s own, smaller Sorento. The Telluride’s tailgate features narrow, high taillights that echo the headlights while pulling a visibility play from Volvo’s book. Details such as a chrome strip that runs partially up the center roof pillar add complexity that works well. The Telluride looks best on 20-inch wheels, but not the black wheels on the range-topping SX that disappear in its big wheelwells. Inside, the Telluride is more carlike. Its dashboard is low and controls are spread out below an infotainment screen that protrudes from the center stack. Telluride LX and S trims have an 8.0-inch touchscreen while a 10.3-inch widescreen gives EX and SX trims a richer look. The interior is at its most dashing when draped in an off-white hue that buyers will regret the moment the first juicebox goes flying. Better choices include black and dark brown, and all interiors are wrapped in either easy-clean synthetic or real leather. Don’t look for cloth upholstery here. The supple 2020 Kia Telluride takes bumps better than many competitors. Every 2020 Telluride leaves the automaker’s Georgia assembly plant with a 291-hp, 262-pound-feet of torque 3.8-liter V-6 underhood. An 8-speed automatic transmission shuttles power to the front wheels or, for $2,000 more, all four. 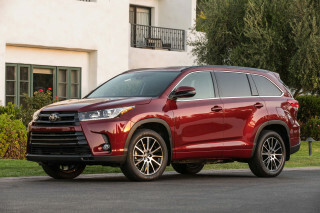 The engine is tasked with lugging as much as 4,500 pounds worth of crossover SUV, and that’s before fuel, luggage, passengers, and pets are loaded up for a road trip. Translation: The V-6 is adequate, but that’s about it. Caveat: We’ve only driven the Telluride at elevations above 5,000 feet, so it should be peppier closer to sea level. We’ll report back when we’ve driven one down there. A hearty stab at the throttle induces prompt downshifts, but the V-6 makes most of its power toward redline. Sound deadening muffles the engine well enough, but passing power is in short supply. The Telluride’s suspension is soft, even with the 20-inch wheels fitted to S and SX trims. We’ve not driven a model with the standard 18-inch wheels, but those tires’ larger sidewalls should make for an even more plush ride. That soft ride doesn’t come at the detriment of handling. Steering heft is firm even in comfort mode, and it tightens up for good on-center stability at speed in sport mode. Most drivers will probably leave the control knob in the default smart mode, which works in the background to tailor the vehicle’s throttle, transmission, and steering heft to the driver’s personality. We hardly noticed a difference between smart and comfort, but your mileage may vary. The Telluride has chunky looks, but off-roading isn’t its game. The optional all-wheel drive system delivered good traction on a wet road during our initial preview drive. A button on the center console locks the electromechanical center differential to split power 50/50 between the axles at speeds below 40 mph on muddy or snow-covered roads. Even without a $800 trailering package that includes a hitch and a self-leveling rear suspension, the Telluride is rated tow 5,000 pounds. The spacious 2020 Kia Telluride has room for everyone and their gear. The 2020 Kia Telluride is on the big side for a mid-size SUV. Its wheelbase stretches 114.2 inches and it measures nearly 197 inches from bumper to bumper. Add to that its 78.3-inch width and the 2020 Telluride takes up more garage than most of its competitors. Telluride SX trims with the optional Prestige package that adds softer leather would almost earn another point for their luxurious interiors, although most buyers will likely take home the more affordable S or EX trims instead. The Telluride’s front seats are supportive enough for longer drives, but a power driver’s seat isn’t standard. S and EX versions have an eight-way power-adjustable throne (including the passenger’s seat on the EX), while the SX adds an adjustable thigh support for the driver. Depending on the trim level, the Telluride offers a three-seat second-row bench or individual captain’s chairs with a narrow pass-through. The captain’s chairs might be good for warring middle schoolers, but the easiest way to access row three is by pressing a button and sliding the seats forward. The Telluride has good space for three kids or two adults in the third row, but the voluminous VW Atlas is still the segment’s champ when it comes to third-row foot and hip room. The standard synthetic leather doesn’t feel as rich as that on some competitors, but it should be easy to clean. EX and SX Tellurides come with leather, and nappa hides are part of a $2,000 option package on the SX. With the third row upright, the Telluride has 21 cubic feet of cargo space. That’s more than most rivals, but much of that is above the window line. The third row folds fairly flat to expand cargo capacity to 46 cubes. With the second row folded, that balloons to 87 cubes. Across the board, those figures are more than most rivals—but the Telluride is also bigger than most of its competitors. We’ve not spent much time in any Telluride other than the SX with a $2,000 package that adds nappa leather and a synthetic suede headliner that don’t feel as lavish here as they do in other Kias. The 2020 Kia Telluride lacks for little when it comes to active safety tech. Every 2020 Telluride comes with adaptive cruise control with stop and go, automatic emergency braking with pedestrian detection, active lane control, and blind-spot monitors. A system Kia calls Highway Driving Assist reads road markings and can automatically change lanes when necessary, although we weren’t able to test the system on our preview drive. A handful of features are walled off for the Telluride SX only, but other trims are hardly lacking. The Telluride SX adds automatic high-beam headlights, forward parking sensors, and a surround-view monitor. A head-up display is optional on the SX, too. Halogen projector headlights are standard on LX, S, and EX Tellurides, while LEDs are exclusive to the SX. Even with every option selected, the 2020 Kia Telluride is a good value. The 2020 Kia Telluride comes in four trim levels, all of which offer a lot of crossover SUV for the money. 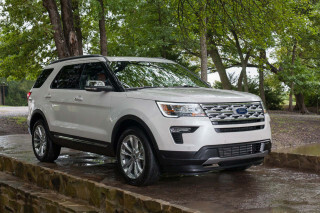 The base Telluride LX costs about $32,700 and includes three rows of seats including a middle-row bench seat, synthetic leather upholstery, active safety tech, power features, an 8.0-inch touchscreen for infotainment with Apple CarPlay and Android Auto compatibility, five USB ports, Bluetooth, and keyless ignition. All-wheel drive costs $2,000 on all trims. For about $2,300 more, the Telluride S has a flashier look with its 20-inch alloy wheels and dark gray exterior accents. That’s a lot to pay for styling, although the S trim does include rear-seat captain’s chairs, heated front seats, and power adjustment for the driver’s seat. We’d bypass the S in favor of the Telluride EX that costs about $38,200. It adds a 10.3-inch widescreen display, leather upholstery, cooled front seats, three-zone automatic climate control, a wireless charging pad, a sixth USB port, a power tailgate, and a sunroof. 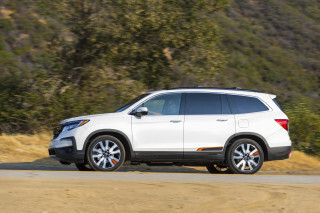 That’s where we’d stop, unless the Telluride SX’s Harman Kardon audio, 20-inch wheels and surround-view camera system are worth $4,400 more to you. The SX is the only trim level with an option package. For $2,000, the Prestige package adds nappa leather, heated and cooled second-row seats, a head-up display, a heated steering wheel, and a few other features. The Telluride is covered by a 5-year/60,000-mile bumper-to-bumper warranty that’s longer than most rivals. The 2020 Kia Telluride could use a hybrid option. The 2020 Kia Telluride is about average for a three-row crossover SUV of its size when it comes to using fuel. 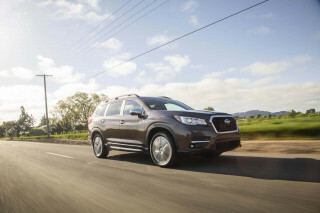 With standard front-wheel drive, the Telluride is rated at 20 mpg city, 26 highway, 23 combined. Opt for all-wheel drive and those figures dive to 19/24/21 mpg. Those figures are typical for a three-row crossover SUV. Competitors such as the Subaru Ascent and Mazda CX-9 best the Telluride with all-wheel drive and rate 23 mpg combined, according to the EPA. A hybrid powertrain would help the Telluride, but the automaker hasn’t said if one will eventually arrive. Looking for a different year of the Kia Telluride?